So well-known and influential are the underlying devices of William Friedkin’s “The Exorcist” that few among modern filmgoers now remember the power of their source. Perhaps the most notorious of all horror films, it was the product of a time still concealed in the facade of restraint when it came to visiting the devious corners of a filmmaker’s mind. Shock was always possible – as had been most apparent by Hitchock’s “Psycho,” or Wes Craven’s “Last House on the Left” – but rarely did it stick so persistently in the mind, invariably undermining one’s sense of individual control. We could rationalize how to get away from a crazy killer or how to avoid a menacing threat lurking around the corner, but how did one evade being possessed by a demonic entity? What sense of recovery would have been palpable? Some argue that implication can singlehandedly be credited with changing the trajectory of the entirety of the genre, which by that point had been dominated by homicidal minds or ambitious monsters in lurid fantasy. Here was a movie about real people, real situations and real considerations of faith, in which an innocent teenage girl became the unknowing victim of spiritual violence that stretched beyond existing moral implications. Few among those early viewers can say they walked away from the picture unchanged by the experience, and those that claim otherwise may not be the sorts you prefer to keep company with. Yet to hear those of today’s generation tell it, “The Exorcist” contains little to no value as an instrument of visceral sensations. Raised in the shadow of more vulgar exercises, they do not identify with the underlying nature of the source material, nor are they moved all that much by the austere manifestation of it. Of course that has as much to do with the ongoing perversion of those values as it does with the erosion of sensible observation. If one is to hold the picture up to, say, “The Vatican Tapes” for example, are less experience minds patient enough to wade through the grind of a divorced mother observing helplessly as her daughter becomes ensnared by a nightmare, or would they rather jump right into the crosshairs of slick editing and outlandish visual exercise? The fundamental difference, perhaps, comes down to what they hope to experience beyond the running time. The likes of modern demonic possession vehicles usually suffice for the momentary sensation or jump scares, but rarely anything lasting. Those that hope to contemplate what they see long after the effect has worn down have no greater source to turn to than the 1973 blueprint. 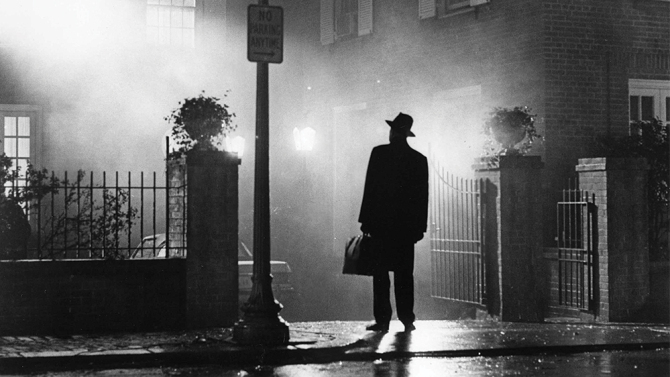 Even stranger still, “The Exorcist” precedes the prevalent trend of faith-vs.-evil formula by a considerable duration. Whereas most trends for the genre catch on within a decade of their benchmarks, nearly 30 years passed before genre filmmakers established a comfort (minus sequels, of course). Great voices attempt to reason with this prospect in discussions of exhausting research and contemplation, but the real answer, I suspect, is far simpler: there was no desire to create clones when the original had remained a powerful beacon across countless rereleases in theaters and home video markets. My first viewing of the picture occurred on cable television in 1994, at the impressionable age of 13; even with its numerous edits there was a sense of something sinister lurking beneath the surface of the straightforward scenes, and the more graphic moments packed the wallop of a sharp punch to the gut. Nearly every moment of the last act was viewed through eyes peeking between nearly-clenched fingers, and there is a moment during the climactic exorcism when Linda Blair’s eyes roll back to reveal the most believable face of evil I had ever seen in a movie. I have revisited Friedkin’s mad act of muscle a plethora of times over the years – both in original form and special edition edits – and with each comes the realization that personal endurances are not always subject to evolution; in some ways part of us, hardened and increasingly resistant to danger, still cower down when the moral implications of a situation like this are stripped of their protective tissues. And as our eyes develop a certain tolerance for the images, that leaves us in the isolating embrace of the subject matter: still a constant source of fear and psychological challenge if you allow it to be. The prologue scenes reflect this possibility in meditative clarity, featuring Father Merrin (Max von Sydow) acquiring totems at a dig site in Northern Iraq that are the precursor to something greater: namely, a confrontation with a malevolent force that has haunted him for most of his life. The menacing throb of a synth in the soundtrack amplifies his rather docile expressions, and the movie wisely cuts between contemplation and urgency to suspend the direct horror of the discovery. And then comes the famous shot of Merrin and the statue of a demon situated atop a hill in the desert – each on opposing sides of the camera frame, caught in what appears to be an unintentional staring match. What force belongs to that visualization is not the devil himself, per se, but no less significant: a force capable of great harm and manipulation. When the movie ventures into Georgetown on a quiet morning, the heroine Chris MacNeil (Ellen Burstyn) is seen studying pages of a screenplay when she hears strange noises in the attic. What are they? I have a theory, but so do you – and both are sourced from powerful foreshadowing. Daily life grinds away for Chris – a Hollywood actress on location shooting a movie about campus protests – and we even see cheerful engagements with her daughter Regan (Linda Blair), who has a recent affinity for Ouija boards and imaginary friends. But then their interactions are elevated when the movie shows them seeking medical advice for recent behavioral changes. Regan grows restless and agitated. There is a moment during a casting party in which see prophesizes the death of a party guest and then urinates on the floor. Her bed starts shaking uncontrollably, inspiring frightened screams. Witnesses, including her mother, are equally dismayed and dumbfounded by the events, but audiences have the foresight to sense the source of them, even without knowledge of the premise or its intentions. Meanwhile, the movie cuts back and forth to a subplot involving Father Damian Karras (Jason Miller), a former psychiatrist-turned priest whose faith is undermined by a strained relationship with his mother, who has become fragile and requires the care of a hospital (though she is defiant to the very idea). That unfortunately leads to her accidental demise and Damian’s overpowering self-loathing, a reality that manifests just as Chris’ own world is dramatically shifted by the arrival of a demonic force within her daughter. Those are amenities, of course, supplied by a plot that will obligate Karras (and even old Merrin) to become beacons against Regan’s spiritual possessor, although the film does rather perceptive things leading up to that scenario. The possession progresses gradually, leading to a startling scene in which Chris finds her masturbating violently with a crucifix. The demon plays mind tricks on those in earshot, taking on the voices of those once close to the targets. Doctors are stupefied by Regan’s strange illness. Is it the result of a tumor in the temporal lobe of her brain? A pathological state that can’t be understood? When Karras meets the girl for the first time at the beckoning of a distraught mother, the camera nearly quivers in awe of the visual: Regan is no longer a child, but a body housing the vision of a living monster. To describe one’s first encounter with the possessed girl is to find that words are inadequate for the challenge. It is one of the most frightening images ever seen in a movie – sinister, repugnant, utterly plausible, and played up in ways that call no attention to the sheer technical triumph of the undertaking. Like a maddened conductor obsessed with the music, Friedkin doesn’t give us time to contemplate the very aesthetic of his horror; we can only gaze on hopelessly as we are swallowed in its trap, desperate with hope that the priests who are destined to arrive will somehow – impossibly, it seems – be able to cast out the entity and restore the girl before she is lost to the nightmare. That attempt doesn’t arrive in a rush of exposition, either. It waits, patiently, for the defenses of the characters to erode. There are scenes of long, agonizing discussions that arrive at only hopeless conclusions, usually followed by tears or shocked gazes. Violence comes for those who attempt to reason with the demon (some of it fatal). And then there is the climax itself, absent of musical cues or freedom of space, which tests the literal endurance of the audience: it is long and almost insufferable in its length, deepened further by overreaching claustrophobia and an uncertainty in optimistic outcomes (is there any happy ending, really, even if the girl is restored and the demon exiled?). If the visceral nature of such details is lost on those who would absorb them today, then the performances remain a force of wondrous resonance. One is hardly surprised to sense that possibility with Ellen Burstyn and Max von Sydow, perhaps, but young Linda Blair is revelatory in her adaptability, both as a likable teenage girl and a vessel for unspeakable horrors. Extensive making-of documentaries (some of them preserved on any number of DVD and Blu-Ray releases) emphasize her abilities as part of undeniable professionalism; even as a child she seemed aware of the clear separation of fact and fantasy, and one senses her awareness of the task is undaunted by the looming terror of the premise. Many others disagreed at the time (Pauline Kael famously denounced the film for shamelessly exploiting its young star), and the movie is often credited with creating the notorious “child in danger” ploy often scattered throughout later horror films (many of them inferior or trashy). But what remains on screen is paralyzing, a monumental example of the abilities of young stars when their purity is tested in the grip of something so morally challenging. Blair would not go on to have the lucrative career that her debut would have suggested (some say her reprisal in “Exorcist II: The Heretic” did as much damage as its predecessor did favors), though one is inclined to question her choices rather than her impenetrable work ethic. Friedkin, on the other hand, is rarely spoken of with more than passive respect. Though his roster was preceded by “The French Connection” and contains “Cruising” (a very underrated film) and “To Live and Die in L.A.” (an audience favorite), legend continues to circulate among film circles of his difficult nature, and indeed many of those in “The Exorcist” have been candid about his radical nature (the most famous anecdote: Friedkin slapping one of his actors on the face to get a shot of his shaking hands). Though he remains unapologetic about such methods, regrets were eventually formulated in other ways – most apparently in a 25th anniversary recut of the film, which restored many of the scenes that its writer, William Peter Blatty, treasured above the director’s personal choices. That is the version most widely circulated now in home release, of course, though it is by far the more inferior. Some of the added sequences (including the notorious “spider walk” scene) are like lost treasures among fans, certainly, but others – including a preposterous rewrite of the ending – stick out like failed experiments that were allowed to go too far (Blatty’s ending is unnecessarily more direct at implying good prevailing over evil, and with dialogue that is ridiculously implausible). How much of the momentum is disrupted by these inclusions is best left up to viewers with varying levels of familiarity to the original cut, although I suspect those of us on that end of the spectrum are far more bothered by the changes than the casual observers. What unites us all, hopefully, is the acknowledgment of profound undercurrents lurking underneath images once seen as the most shocking of any mainstream endeavor of this genre. This is a movie that believes in evil, and sees no point in dancing around the inevitable acknowledgments. Ultimately we receive exactly what we hope to take from it, though one suspects less experienced minds not realizing so until long after spinning heads and projectile vomiting have drifted beyond the primary line of sight.